Ever written a test and found yourself copying and pasting it multiple times to pass in different pieces of test data? Particularly if you have multiple classes that transform the same input data. I am currently working on some client side libraries that work off transfered Data Transfer Objects (dtos). So most of the client classes take these dtos as input. One such class is a Json Adaptor that converts any dto to a string and back again (internally it uses the .Net Json serialiser see DataContractJsonSerializer with some more goodness injected). To test this class I need to give it a wide range of test data. Including many different types of data, and with each type instantiated with a wide range of values. I created a library of test data in the Data namespace, with each type in this namespace offering many different instances of the type. I could use the NUnit [Values] attribute, but this requires me to hard code each set of data for each test method. Not to mention its an uglier syntax. Maybe acceptable for basic scalar types and strings, but not for objects imho. If I add more test data, it won't be applied to existing tests. Using TestDataSource attribute allows you to use a method to gather the testdata programmatically. 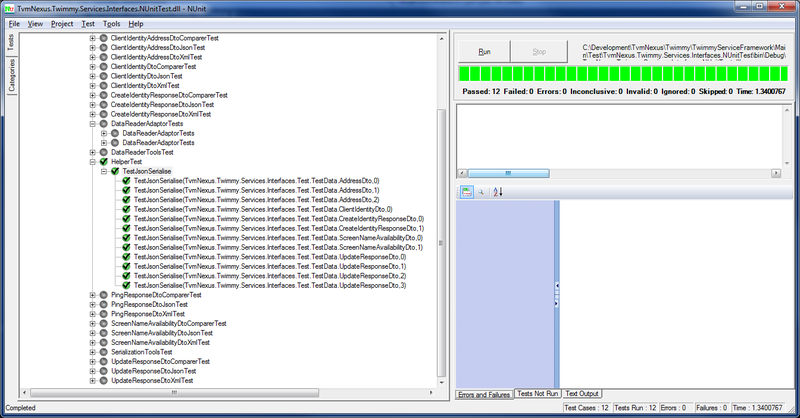 Suffice to say the GetTestDataItem method in the Test gets the actual test data input from the type passed in. This type argument has a static property that presents an array of test data sets. Each set contains the object, the matching xml serialisation string, and the matching json string. A little crude using reflection, (not cool in heavily used production code) but it works like a charm for testing.